Born in Kansas City, Missouri, Troy Kinney attended the School of Fine Arts at Yale University, graduating in 1896. He worked for a brief period illustrating newspapers in the Baltimore area before moving to study at the Art Institute of Chicago. He met and in 1900 married his wife and collaborator Margaret West Kinney. Together, working under the joint name "The Kinneys", they created numerous works for books and magazines, including covers for Harper's Bazaar. Doris Niles. He contributed articles on dance to magazines including Century, Metropolitan, and The New Republic, and co-authored with his wife the books "Social Dancing of Today" and "The Dance: Its Place in Art and Life", for which he traveled throughout the world to study various dance styles. It remains to this day one of the most comprehensive works on the subject. 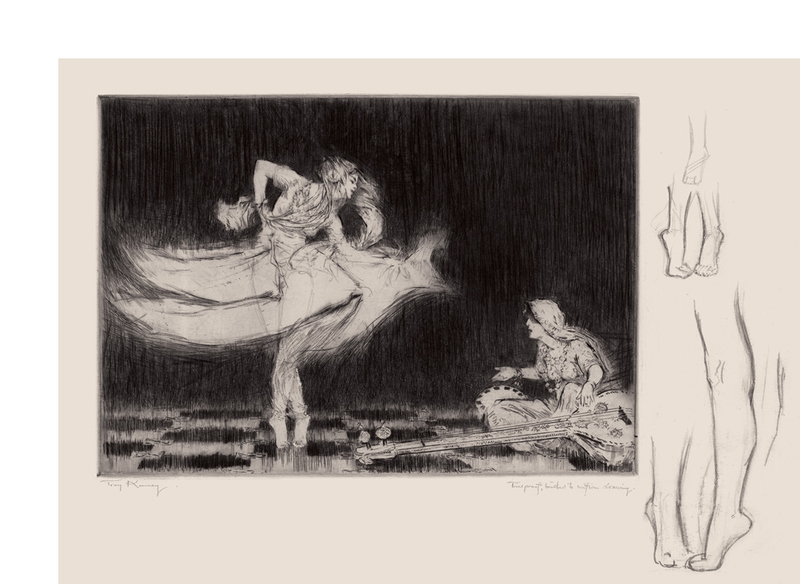 Troy Kinney was a member of the Chicago Society of Etchers, the Society of American Etchers, and the National Academy of Design. 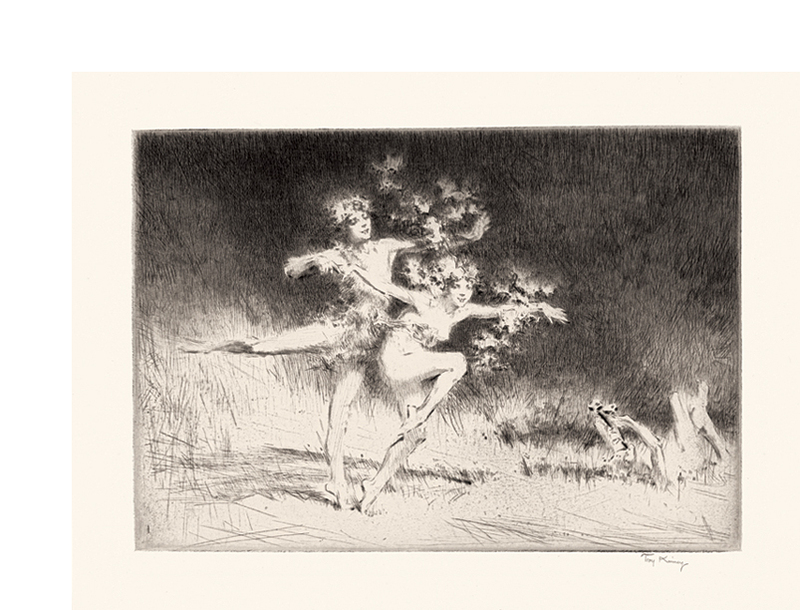 His works are included in many public collections including the Chicago Art Institute, the Cleveland Museum, the Library of Congress, New York Public Library, Yale University, and many others. 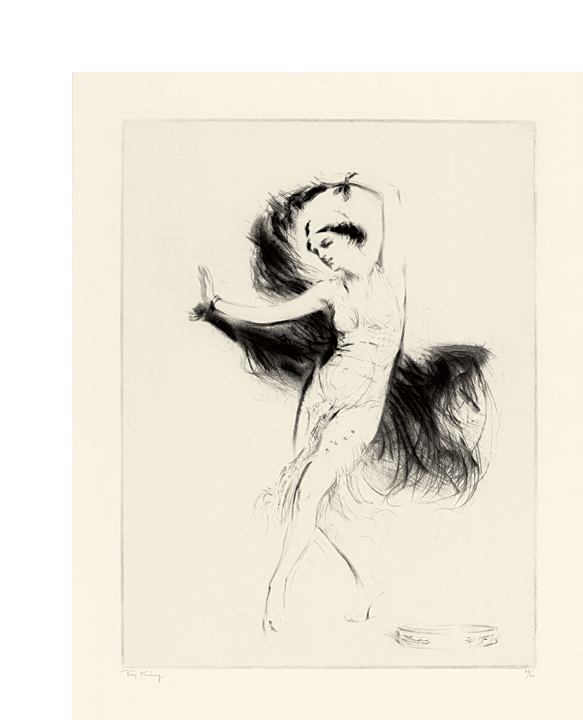 Sophie Planz in Cleopatre - - 1917, Drypoint. Kinney 16. Edition 50. Signed and numbered 33/50 in pencil. A fine impression, on cream Japan, with full margins (2 1/2 to 3 15/16 inches), in excellent condition. 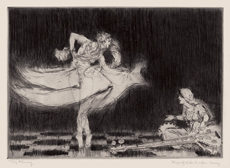 Roshanara - - 1918, Drypoint. Kinney 22. Edition 50. Signed and annotated Trial Proof touched to confirm drawing. A fine impression, on heavy dark cream wove paper, with full margins (2 3/8 to 5 1/4 inches), in excellent condition. 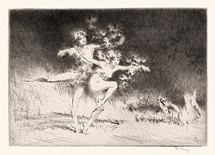 A unique proof, ‘touched’ by the artist on the image in pencil and also with detailed drawings of the position of the dancer’s feet in the wide right margin. 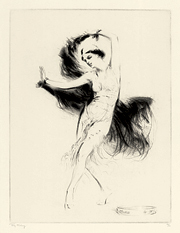 Vera Fokina in Her Dance of Salomé - - 1920, Drypoint. Kinney 27. Edition 50. Signed and numbered 14/125 in pencil. Image size 10 15/16 x 5 3/4 inches (278 x 146 mm); sheet size 16 1/4 x 10 1/4 inches (413 x 260 mm). A fine, rich impression, on antique off-white wove paper, with full margins (3 1/8 to 2 1/8 inches). Hand-ruled border in pale grey ink 1/2 inch away from the image, apparently made by the artist; in excellent condition. Vera Fokina was a Russian ballerina who supported the reforms of her husband, ground-breaking choreographer and dancer Michel Fokine; dancing in many of his ballets under the aegis of the Diaghileff company. The couple moved to the United States in the 1920’s and later became U.S. citizens. Moonlight - - 1925, Drypoint. Kinney 45. Edition 125. Signed in pencil. Image size 7 5/8 x 11 1/8 inches (194 x 283 mm); sheet size 11 5/8 x 15 inches (295 x 381 mm). 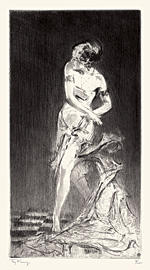 A fine impression with delicate plate tone, on cream laid paper; full margins (1 7/8 to 2 inches), in excellent condition. 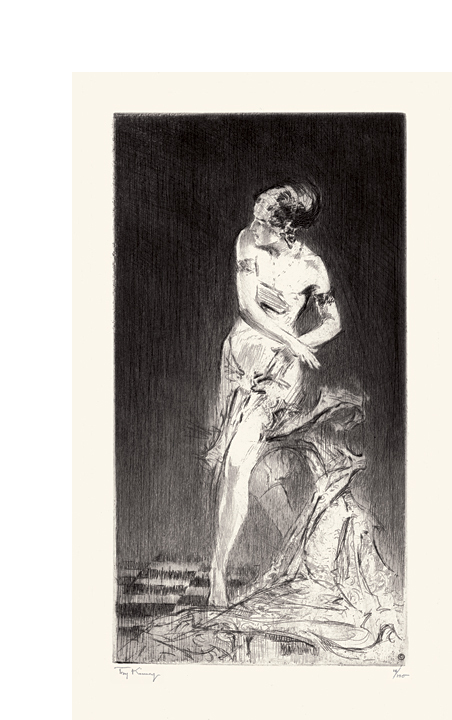 Reproduced: Troy Kinney: American Etchers, Vol. IX; Crafton Collection, 1930; and A History of British and American Etching, James Laver, 1929.